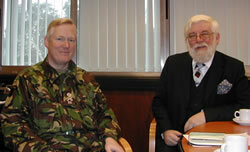 This picture of Councillor Paul Lynch with General William Cubitt, General Officer Commanding London District (right), shows where boasting will get you. The two first met at the Greater London committee for Cadets and Territorials, where Councillor Lynch was pointing out the amazing record of Hounslow young people in the Duke of Edinburgh's award scheme. General Cubitt wanted to meet the staff who ran such a successful scheme and immediately arranged a visit. The General enjoyed a chat with the Leader of the Council, Councillor Peter Thompson; the Chief Exec, Mark Gilkes; Kath Angus of Hounslow's Youth Service and Councillor Lynch. He is keen to extend the Army's outreach work into Hounslow, and further discussion are planned between the Youth Service and the Army to get young people a taste of assault courses, expedition training and other exciting activities. He will also be taking an interest in the Duke of Edinburgh scheme over the next year, hoping to discover Hounslow's secret and involve more young people in the scheme. Councillor Paul Lynch and Kath Angus were delighted at the offer of facilities for the young. "This is the sort of fun that builds confidence and improves health. We need to improve contact between all residents and the armed forces, and this is a really good start. Whatever one does in life acquaintance with the army is always a help,"
Councillor Lynch should know, he served with the Royal Signals from 1964 to 1967. He said, "My stint was very long ago, all my friends have now retired, but some things don't change, a general's visit is still an important event. I was up early shining my shoes, and wondering if I should have had a haircut. We are looking forward to working together and being able to offer even more exciting opportunities to young people in Hounslow." General Cubitt commands all the army units (regular and territorial) inside the M25, plus Windsor. He is in charge of all the ceremonial (changing the guard and trooping the colour,) as well as providing security for the capital.